The fifth module of this course deals with access to web services from gvSIG. At this first part we will introduce you to a fundamental concept when we talk about the efficient management of geographic information: Spatial Data Infrastructures (SDI). SDI are very important, and countries and regions of the world are legislating them more and more to make effective their implementation in all the administrations that generate digital geographic information. The SDI is considered the ideal system to manage the geographic information of an organization and, of course, of a municipality completely. In future modules of this course we will speak about gvSIG Online, the free solution to start them up. In the current module we will see how to work with the web map services that SDI can generate from the desktop GIS. Currently, a large number of administrations offer their cartography in a public way to be loaded through web services. Thanks to the use of this device it is possible to access these services from gvSIG Desktop, which allows us to load the cartography in our project without having to download anything on disk. 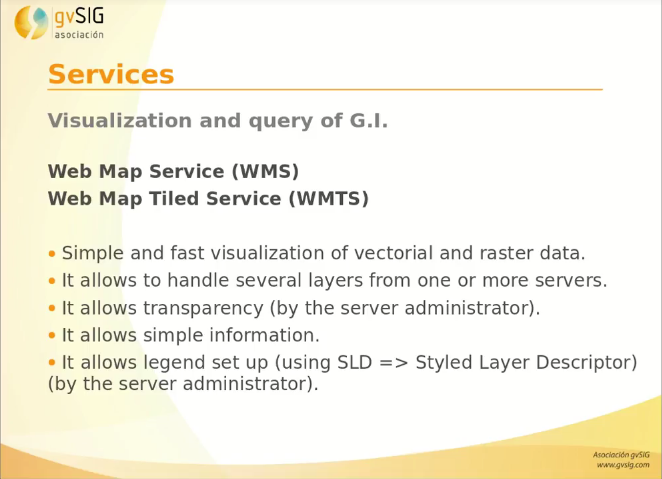 In order to understand this part in gvSIG in a better way we will start with a video about the introduction to the Spatial Data Infrastructures, where we will explain what a web service is, and some links where these available services are collected. In this module it is not necessary to download any cartography, since it is a totally theoretical video. This entry was posted in english, geoportal, gvSIG Desktop, SDI, SDI, training and tagged city council, municipality management, PostGIS, SDI, WCS, Web service, WFS, WMS, WMTS. Bookmark the permalink. Thank you! About SLD legend files, when you have applied a legend, at the “Symbology” tab you have an option to save legend. You can save it as an own gvSIG format (.gvsleg) or as SLD format.